Rain fell on the tin roof as my alarm went off at 5.20am. It was dark outside, and the sun was yet to give any glimmer of light on the horizon. Normally I would have rolled back over, favouring sleep over a ride in the rain, but on this occasion, I had extra motivation. Sitting in the hallway, willing me out of my slumber, stood the Rere, the new aero offering from Kiwi brand Chapter2. I pulled on my kit, threw down a cup of tea to warm up, and walked out the door into the dark, wet morning. I was off to join the Tuesday group ride and eager to test the new bike in the fast group, hopeful I’d perform better than usual. As I rode to the store I noticed a few of the little things. The bike looked narrow. The Shimano Dura-Ace hydraulic discs were quick to stop my 82 kg mass in the wet. It felt fast. It was just a warm-up though, and I was just getting used to the narrow cockpit and the feel of the frameset. As the group took off after 6am and accelerated through city streets and shops, the bike seemed to spring to life. The pace picked up and with it came the need for small accelerations and decelerations, managing the space between riders. The modulation of the hydraulic discs gave me complete comfort in the wet to decelerate safely. As the group accelerated, the stiffness of the carbon frame seemed to drive my every watt into the pedals. The bike felt like it was growling at me and urging me faster, like a dog walking its owner, as the rain poured around us. We leant into the roundabout before powering up the first climb. I followed wheels closely with the youngster who looked the fastest, and I survived the first incline. A little downhill gave me time to recover my breath before the final uphill sprint. One by one the group dwindled. My legs were screaming. The last man peeled off the front and left me clear, in the rushing air. I tucked in low, gripping the stiff drops of the Mana bar and stem, and pushed as hard as I could. The top of the climb, by now a false flat, edged closer and closer at high speed. I turned around to see who was with me. There was no one. I smiled in quiet disbelief. I’d never gotten to the top first. Not even second or third, for that matter. The Rere was proving very fast. On the flat of the waterfront a sprint opened up. I leapt into it, heaving the Rere’s one-piece carbon bar and stem as hard as I could. The bars hardly flexed and the frame forced all my power through the pedals with incredible stiffness and enthusiasm. In the 40+ kph range the Rere felt a new beast altogether. With exceptionally narrow tube profiles, it seemed to cut the air like a hot knife through butter. Aero bikes so often come at a compromise. Comfort and weight are often sacrificed to cheat the wind. The Rere, kitted with tubeless WheelWorks Carbon 30mm disc wheels and a Shimano Di2 groupset was fast on the flat and short punchy climbs, but would it perform in the steeper hills of West Auckland? I first tried it on the most brutal road of the Waitakere Ranges, Mountain Road. With two kilometres of the climb averaging over 13%, it would put the Rere to the test. On the lower slopes, where the gradients are gentler, the Rere felt nimble and swift with good power transfer through the bottom bracket. As the climb reared up in front of me and gravity became more of a factor, the bike felt a little heavy. It is true, however, that when the gradients become this steep the weight of the rider becomes a significantly more important factor. Anything short of a five kg super climbing bike will feel heavy on those gradients. What was pleasing was the stiffness of the Mana bar and stem as I wrenched the bike from side to side. I felt like not one watt was wasted as I heaved myself up the side of the hill. The second test was on Titirangi Beach Road. The gradients here were perfect for the Rere and it felt at home racing up the slopes. There is certainly a point where I’d favour a pure climbing bike, but on most inclines the Rere performs admirably, particularly for an aero bike. The most stunning feature of this elegant, locally designed race bike is the Mana one-piece carbon bar and stem. It neatly tucks the cables away from the air without making things difficult for your local mechanic. The Mana bar and stem combo absorbs significant amounts of road vibrations but is incredibly stiff. When you stand up and sprint, either on the drops or hoods, the bar gives no flex whatsoever. On top of this, it looks amazing. The narrow profiling of the carbon tubing makes the Rere look incredibly sleek. My only consideration for its profile is that the narrow downtube doesn’t offer the air a clear path around a bottle that might be on the frame. 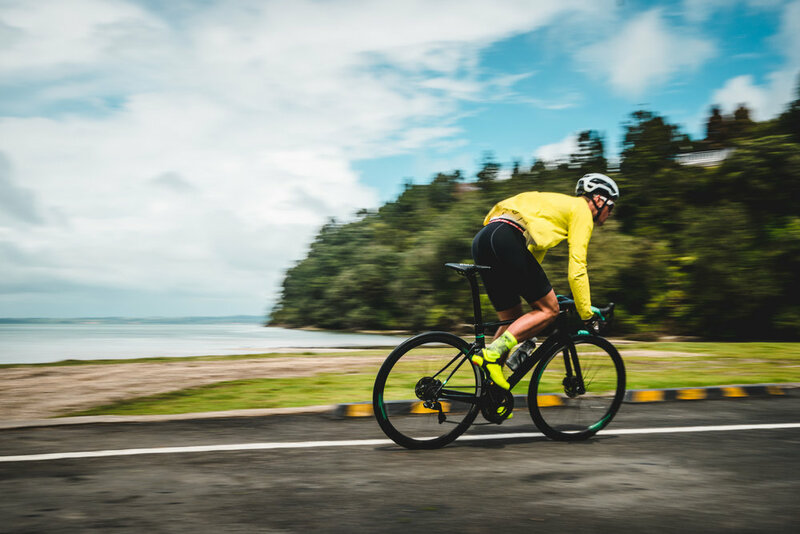 As seen in bikes such as the Pinarello F10 Dogma and the new BMC Time Machine, it is important to consider the impact a bottle has on the way the air flows over the frame. The dropped seat stays form fluidly into the seat tube as is so commonly seen in aero race bikes. The front forks bow slightly wider than most aero bikes and the frame provides enough clearance for 28mm tires. With wider tires and Shimano Dura-Ace hydraulic discs, this bike feels like it’s glued to the tarmac, even in the wet. Another nice touch is the fork crown which fits seamlessly into the fork leg. The bike is distinctly Kiwi. The paint job has tasteful reminders of the bike’s heritage, with intricate koru graphics discretely placed across the frame. The word rere means “to flow” in Te Reo, and the Rere is sleek both aerodynamically and graphically. The Rere is a stunning road bike that excels at high speed. It handles like a dream and is incredibly stiff through the bottom bracket. The cables are neatly tucked into the frame without being so integrated that it makes things difficult for your local mechanic. At a good price point this is a fantastic offering from a Kiwi brand. 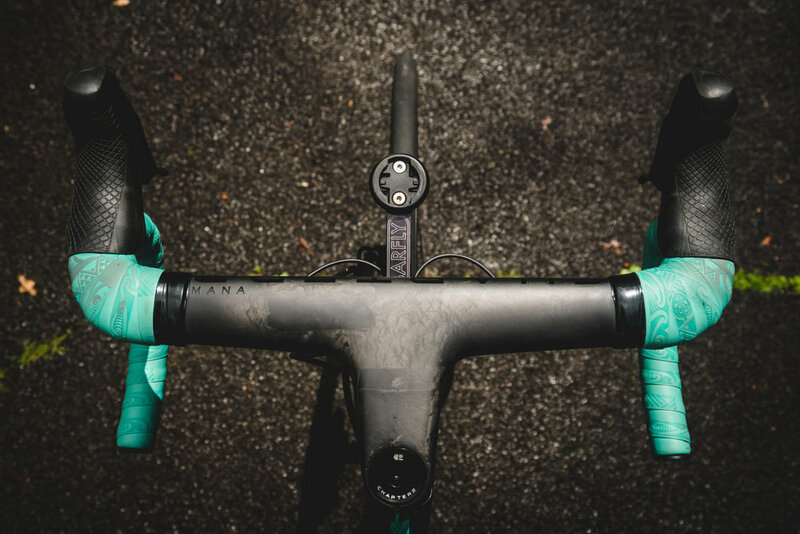 With frame and handlebar options customisable with your preferred components, it is a bike you can build from scratch with your own flair and personality. For the best NZ Cycling, subscribe to our print edition. The Tere, by Chapter 2, is a NZ-designed aero road beast from famed brand Neil Pryde.